Suggested Use: 1 capsule per day for a 150 lb (68 kg) person. Smaller persons should space doses further apart (for example, every other day). Do not use D3ZO concurrently with high-dose calcium supplements, as this could raise blood calcium excessively. D3ZO — a vitamin D formula for people who have an aversion to osteoporosis and cancer. 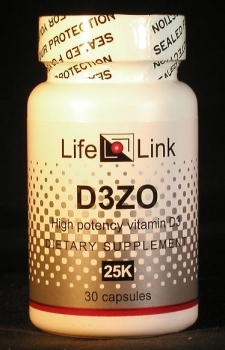 D3ZO is a very high potency vitamin D3 supplement with zinc orotate — a combination that takes advantage of synergistic effects of these two supplements. Vitamin D is a family of fat-soluble substances that are involved in the regulation of calcium usage, cell specialization, immunity, insulin secretion, blood pressure, and related processes. Vitamin D3 (cholecalciferol) is the most powerful form of vitamin D.
osteomalacia — another bone-softening disorder that also causes muscle weakness. increase the severity of flu epidemics. Numerous clinical trials have demonstrated the efficacy of vitamin D supplementation in strengthening bones and preventing falls and fractures. These studies have shown that vitamin D3 is more effective than D2, and that daily dosages of at least 800 i.u. per day are needed to reduce fracture incidence by 65%. Vitamin D is also a remarkably effective anti-cancer supplement. In a study published in 2007 it was found that 1100 i.u. (27.5 mcg) per day of vitamin D3 resulted in a 77% reduction in new cancers. overactivity of the immune system is suppressed, while certain immune functions are promoted — such as anti-tumor activity. Vitamin D3 is not made by plants. It is made in the skin of animals in response to ultraviolet light at wavelengths between 270–290 nm (UVB). For this reason, people who receive no sun exposure and who take no vitamin D supplements are at great risk of becoming vitamin D deficient — with grave consequences. Accordingly, we will limit our discussion of D3ZO to a brief summary of relevant research, and let you draw your own conclusions about what medical conditions it may be effective in treating. Vitamin D deficiencies may also be responsible for the severity of flu epidemics. A research group in the U.S. and New Zealand has found that some of the unexplained features of flu epidemics can be neatly accounted for by low vitamin D levels in the affected populations.17 The implications for public and individual health are enormous: the huge toll taken by influenza on society and on individuals may be avoidable if people simply start supplementing with higher doses of vitamin D.
No one knows the optimum dosage of vitamin D for preventing or ameliorating infections such as influenza. In view of this vitamin's impressive safety record, even at huge doses of hundreds of thousands of i.u./day, it seems reasonable to choose a fairly high dose, such as LifeLink's 25 thousand i.u. D3ZO capsules. LifeLink does not subscribe to the idea that flu vaccines should be avoided. But we believe that vitamin D may offer a second line of defense when innoculations fail to provide adequate protection — which happens when rapidly mutating viral strains are involved, as they are, for example with Swine Flu. Zinc deficiency is believed to play a role in osteoporosis.11 The mechanism through which zinc enhances bone strength is not understood, but is likely to be independent of the mechanism through which vitamin D3 acts on bone. In such situations synergistic benefits are likely to occur when substances are used in combination. There is a gene called ‘klotho’ that plays a central role both in the body’s calcium regulation and in aging.12,1314 Many people have less-than-optimal klotho gene activity, and high vitamin D levels can exacerbate this condition.15 Judging from mouse experiments, this problem is especially acute in females.1616 When this gene has low activity or is defective, the aging process is accelerated; when the gene is highly active, the aging process is slowed. But Japanese researchers reported in 2001 that supplementation with zinc orotate provides a ‘rescue’ from the consequences of low klotho activity, even in females. D3ZO therefore includes zinc orotate as a second active ingredient. LifeLink’s monograph on zinc orotate describes this supplement in more detail. This is a very high potency vitamin D3 supplement. Since vitamin D3 enhances the absorption of calcium and decreases its elimination by the kidneys, it is important not to use high-dose calcium supplements in combination with this product. Too much calcium in the blood can result in a condition called “hypercalcemia”, typical symptoms of which are weakness, loss of appetite, nausea, confusion, and lethargy. D3ZO is intended to enable users to get the bone benefits of mega-dose calcium supplements without having to take mega-doses of calcium. Is D3ZO useful for the conditions and purposes mentioned above? We aren’t allowed to tell you, so you should take a look at some of the references cited here, and then decide for yourself.